This retro poster perfectly encapsulates the B Movie Monster Film style that the film evokes. What we get as an end result from Frankenweenie is a fantastically fun piece of family entertainment that is at times quite scary considering its market (good on ya Burton, kids do need a few scares too from time to time; something that most studios shy away from) - which is a very important factor as the film itself actually works brilliantly as a pastiche of classic monster movies. It's unbelievable how many classic horror films and monster B movies that the film is able to pay homage to within its 87 minute run time - the obvious of course being Mary Shelley's classic gothic story Frankenstein, upon which the main story is inspired. But then there are nods to Dracula, The Mummy, The Wolfman, The Bride of Frankenstein, Igor, Van Helsing, Gremlins, Creature from the Black Lagoon, The Invisible Man, Godzilla, and many, many more - part of the fun is trying to find them all! This genre pastiche is executed superbly throughout the entire film, which itself feels like one of the B movie monster films that it is referencing; thanks to the choice to make the film black and white (a brave and highly commendable choice), the stop-motion animation that I'm a huge supporter of (which feels appropriate concerning the monster characters which were often Ray Harryhousen-esque clay creations in the referenced films), and even the use of font which is not unlike that incredibly clichéd font that you'd likely recognise from all of those old B movie horror films and their trailers and posters. It's not something that I usually do in my reviews, but in this case I'd like to talk a little bit about 3D for a change! Usually I avoid the matter in all of my reviews as my opinion on the cheap glasses gimmick is always the same: don't bother! I've never found the cheap effect to ever add anything to any films - only to take away, primarily from your wallet - and I actually think that if the big 3D king Avatar was released today in the midst of the 3D run that people wouldn't actually care about it that much, and that it was only a big deal because it was most people's first digital 3D release (watching it through rose tinted glasses - well, grey polarized glasses); and the 3D films are almost always available to watch in 2D anyway. 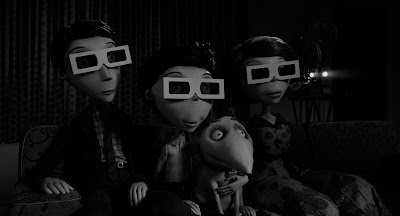 However I feel compelled to mention 3D in this case because you know what; it actually added something this time around. Yes, you heard that correctly; I just said something positive about the inclusion of 3D in a film! 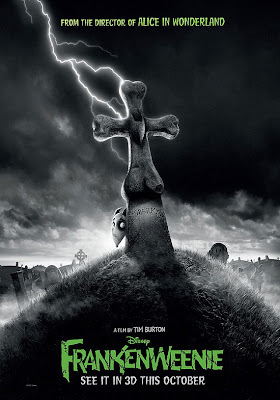 Earlier this year we saw Joss Whedon pay tribute to the modern horror film for adults in The Cabin in the Woods, now Tim Burton has created a lovely companion that is a pastiche to the early horror genre and B Movie Monster films that Burton adored as a child. 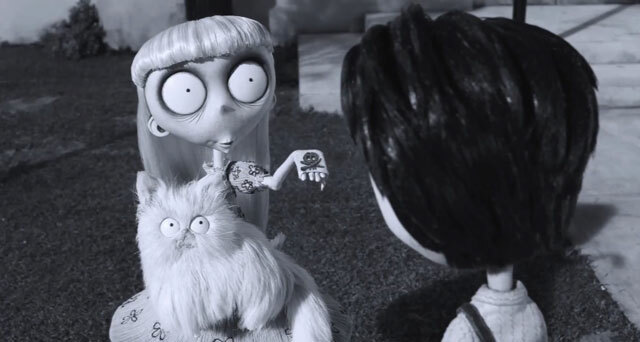 Frankenweenie is a lovingly crafted stop-motion animation that may not be the next Nightmare Before Christmas, but certainly is up there. A lot of fun and with a scare or two thrown in for good measure, this is a film that everyone can watch and enjoy together as a family (even one that parents and film-lovers might actually enjoy more); and one of the best things I can say about the film is that it actually changed my mind on 3D if only briefly, with the effect - or rather the lack of any significant one - actually adding something to the narrative of Burton's wonderful film! Frankenweenie (certificate PG) is released in cinemas across the UK on October 17th 2012. 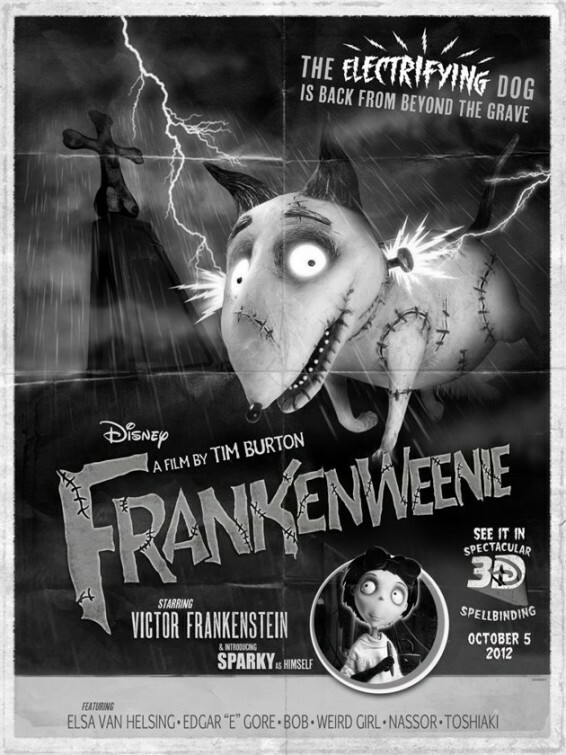 Is Burton onto another winner here, or is Frankenweenie destined for the dog house? If you've seen it what did you think? Leave your comments below!